FREE Same Day Shipping Order By 4pm. Pontoon Seats In Stock. With 19 inches of seat cushion depth our Premium pontoon boat seats provide all-day comfort with the largest, most plush pontoon seats available. A mix of different density foam, our soft touch vinyl and double-top-stitch seams provide unmatched comfort, durability, and beauty. 100% plastic-framed pontoon furniture with stainless steel hardware. We don't hide wood under our upholstery! Our pontoon seats will never rot. Our 55" pontoon boat seats use a pair of 27.5" plastic bases, which provides maximum support across the large seat cushion and two separate areas for storage. Drain channels are molded underneath and inside all bases on our pontoon furniture. This ensures that water can escape your deck and never pools in your seat. Overall Pontoon Seat Width: 55"
Our DeckMate® pontoon furniture stands out because we build it with better materials, and back up our quality with a 3-year warranty. You know you're getting the highest quality pontoon boat seats because no other manufacturer will match that guarantee. And since we design, build, and sell our pontoon seats directly, we can offer superior furniture at affordable prices. Our Premium pontoon boat seats use plush, pillowed seat cushions with a mixture of soft and dense marine foam for all-day comfort. We use double-top & standard-top stitching on all stress points, so you never need worry about torn seams. Our pontoon boat seats look new longer! Our pontoon boat seats will last. The quality of the vinyl used on your pontoon boat seats won't matter if your seams tear or rot. That's why we use the best UV & mildew treated polyester thread. SunStop® thread (click for info) is designed specifically for the outdoors. Many pontoon furniture manufacturers use the same nylon thread used in office furniture because it's cheaper, but this thread will not last longer than 3 years in the sun. 30oz marine-grade seat vinyl is coated and treated with antimicrobial agents and UV stabilizers to exceed industry standards for UV and mildew resistance. This is one of the most important features of our pontoon seats. When you see aftermarket pontoon furniture that has mildewed or begun to crack prematurely, it's often because the manufacturer used poor quality vinyl to keep costs low. This won't happen to our pontoon boat seats. With top-quality treated vinyl, you won't need to replace them after 3 years. Our pontoon boat seat cushions are built with a mix of soft and dense foam to give you support and comfort where it matters most. 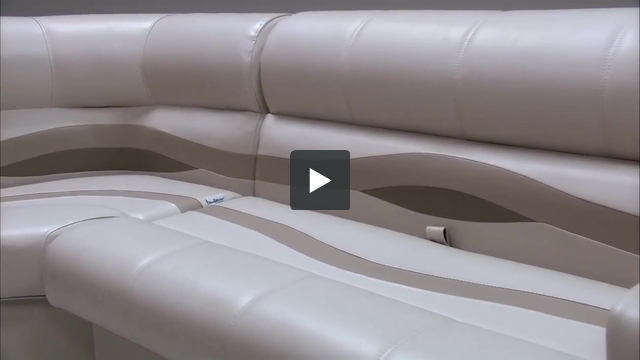 Our Premium pontoon boat seats are built with thicker, softer seat cushions. The fully enclosed plastic bases used on our pontoon boat seats have molded drain channels designed into them to increase the life of your pontoon's deck. When water is allowed to escape your deck quickly, instead of being trapped and left to soak into your carpet and decking, the lifespan of your flooring greatly increases. No wood! All of our pontoon furniture frames are plastic. We use injection-molded plastic seat cushion frames and rotationally molded plastic seat bases. High-grade stainless steel hardware and staples are used on our pontoon seats, along with t-nuts, which are inserted into the plastic bases to secure each pontoon seat cushion. 1 – Insert stud bolts (E) into the T-nuts located in the black plastic bar on the bottom of the seat back cushion. 2 – Place the seat back rest within the designated space on the plastic base and secure the 1” Washers with the wing nuts (B) from the inside of the pontoon seat base. 3 – Align the seat hinges that are attached to the pontoon seat cushion with the nut inserts located on the front edge of the plastic seat base. Can I buy seats only using my existing bases? Unfortuntately, our Pontoon Boat Seat Cushions are designed for our bases. So we would only be able to them as sets. I want to do my sun deck with the same kind of foam used in your seats. I already ordered the vinyl and seats from pontoon stuff. What type of foam and thickness would be most appropriate to give the same feel on the sun deck? That would be your preference. We do use a molded foam that is sturdy enough over long periods of time. Also, you would want to make sure you are using a marine graded foam. Are these seats available in solid white? (e.g. - no colored stripes). No. The only colors that we have available for the 55" Pontoon Bench Seats are the ones located in the drop down menu. What brand vinyl do you use for the seats? If I order seats, can I purchase a few yards of additional vinyl for our sun deck on the boat? Hi , I noticed on some of seats it says , must be supported by rail , I'm looking at the 55" on this model it doesn't say that , I'm looking to put multiple 55" bench seats , but I have no rail to support back rest , will the 55" model be strong enough free standing with rail for back support ? I'm sorry about the confusiion but are we in the process of updating all of our listings. The 55" pontoon bench seat does need to be supported by the rail or some type of support system. From the floor of your pontoon to the top of back rest of this seat is 30". The overal depth of this pontoon seat is 27". The 19" measuerment is the depth of the seat cushions only not including the back rest of the pontoon seat. I plan to mount speakers in several seats. Are the seat bases double walled or single walled? Wondering if I'll need to fish wire between and if I have to be careful of the depth of my speakers. Thanks! They are single walled bases. You can easily cut into the bases with a jig saw. You will have plenty of room for the speakers and to run your wire because the ponroon base opening is large. Does the back rest need to be supported by railing? Yes this pontoon seat will need to be supported agains the railing on your pontoon boat. 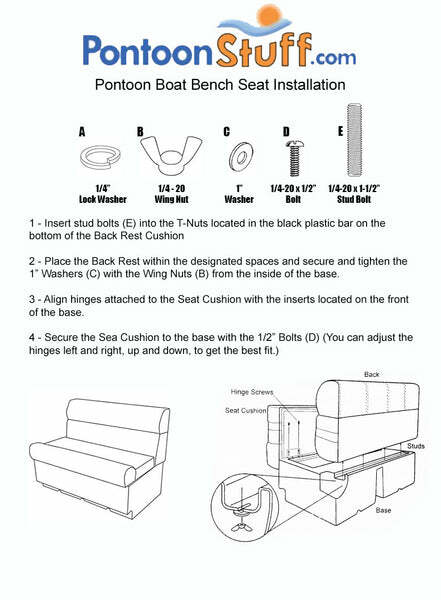 Yes, all of our pontoon furniture comes with the seat cushions and the plastic bases plus all the mounting hardware you'll need for assembly and installation on your pontoon boat. Our 55" pontoon boat seats weight approx. 80lbs, this includes all the seat cushions and the plastic bases. Unfortunately we don't sell just the seat cushions but we do replace cushions on our seats. The reason we don't offer them separate is our seats are designed to fit our bases so the hinge points will not line up with what you have. Also, our seat cushions are much deeper than most and they just can't fit unless you build a custom base for it. I wish we could be more helpful. What hardware do I use to install the new seats to my deck? All of our pontoon furniture bases will come with stainless screws that you can use to attach your seat bases to the deck of your pontoon (4 screws will be in a packet in each plastic seat base). Once you have all the pontoon seats in place you can use a screw in each corner of the base to secure it to the deck, nothing more is really needed. One thing that almost all pontoon manufacturers also do is run sheet metal screws through the outside railing directy into the back rests of the pontoon seats. We don't provide hardware for this as we found most customers get to nervous to run screws though the uphostery but if your railing has holes in it I'd recommend getting some sheet metal screws and securing the backrests of each pontoon seat to the rail. This will not void any warranty and it will help to greatly strengthen the railing and the furniture on your pontoon, holding everything together very nicely. How is this furniture installed? Also, what do the seat backs look like? Thanks. The back rest seat cushion is completely upholstered over an injection molded plastic frame. At the bottom a section of the seat frame protrudes slightly and you drop it into a channel on the plastic base so it can be bolted down. Our 55" pontoon seats will arrive to you in 2 boxes. One box will contain all the seat cushions and hardware and the other will contain the 2-27.5" wide bases that will support the cushion set. To install first you will insert threaded stud bolts into the back rest frame and drop it in place on the base (the base has a channel that the back rest drops into). Once in place you simply attach the back rest with wing nuts and then hinge the seat cushion down to the bases. Hinges are pre-installed on all of our pontoon seat cushions so you just secure the bolts to the t-nuts that are on the plastic base. It a pretty simple process, thank you. No. The closest we have to a 50" inch Bench Seat is the 55" Bench seat. Where do I purchase the replacement cushions for the sun deck? We currently do not offer replacement cushions for sun decks. Many of our customers will buy our matching seat vinyl by the yard and have a local upholstery recover their exsisting pontoon sundeck. Does bolts/hardware come with seats to install/bolt them down? Yes, you should receive all the appropriate hardware to install the seats. Screws for install the base to the Deck. Is there storage beneath the seats? Yes. These come with 2 27.5 bases, that add support for the middle of the 55" Seat cushion. Unfortunately, none of our seats can be used as a LiveWell without some kind of modification. I’m restoring an older fishing style pontoon boat that the front fending is lower than normally found on traditional pontoons. I’m changing it to tradition seating. What is the minimum fence height to property support the premium seats? The acceptable heighth for the Railing should be around 24" to fully support the back rest. I have a distance of 109" from back rail to fence gate.. the closest combination of seating I can come up with is 111". will the bases push together enough to make up the 2 difference? Unfortunately, we cannot recommend using anything over the amount of space you have available. If I decide to run a sheet metal screw through the railing into the back rests on my new furniture, what length stainless steel screws would you recommend? My railing is 1 1/4". What size screw? Would a #12 work? And how far apart should they be placed? We would suggest using approx, 2 inch screws if you are wanting to mount them to the railing. #12 would work just fine. My boat is 8’6” wide. Do I need two 55” couches to span the width or are there two corner pieces to fill up the width? You will need to find the available space measurements from inside rail to inside rail. Then we can help you with finiding a configuration that will fit. Unfortunately, we do not offer seats that fold out into a bed. Do you recommend bolting the bases together to tighten gap between them? That is always an option. These Seat will sit flush agaisnt each other. But that is of course an option. I recently purchased these seats for my pontoon, they look great. However , after being in the sun for one day, the vinyl sticks together from the seat to the back. What should I do to stop this? You can adjust the Pontoon Seat Cushion from the hinge. There is about 1 -2 inches that you can adjust the seats where they are just barely touching. You have should have received 2bases inside 1 box. We band these items together for shipping reasons. Please email us at Support@pontoonstuff.com if you still have issues. Please include pictures if you choose to do that. how do you attach the 7" arm rests to the seats? The 7" Pontoon Arm Rests can be attached in two ways. One, you can use the screws given to attach it to base of the seat next to the Arm Rest. Or, you can use the same screws to attach them Arm Rest to the deck of the boat. These Pontoon Boat Seats do not need to be attached to the railing. They just need to be supported by it.